A faculty member of 40-years, the late Dr. Gerald Bedford was a true champion of The University of Winnipeg and a passionate contributor to education in Canada. 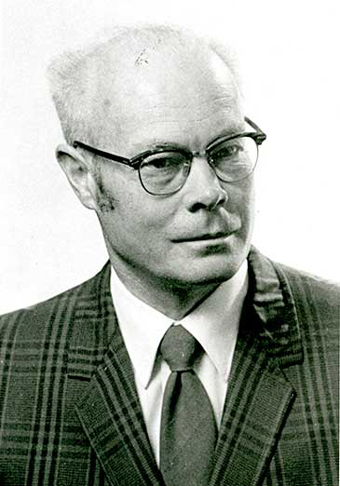 Bedford graduated from United College (now UWinnipeg) with a BA in mathematics in 1948, before pursuing his true passion and obtaining a PhD in English Literature from the University of Toronto. He was an active member of the university community, serving first as a student president during his studies and then as a lecturer, registrar, and professor during his long career as a faculty member. For his dedication to UWinnipeg, Bedford received the Farquhar Award for Contributions to University Governance and the Robson Award for Excellence in Teachings. He received the Distinguished Alumni Award in 1992, and was admitted to the Fellowship of United College in 1993. Bedford also served as UWinnipeg’s historian, writing two books about the creation and early years of United College. The second installment, The University of Winnipeg Volume II: The First Forty Years (1967-2007), was published in 2007, and the first book, The University of Winnipeg Volume I: A History of the Founding Colleges, was republished in 2008 following his death. Outside of the University, Bedford was active in curriculum and teacher development for schools across Manitoba. He was also a founding member of the Association of Canadian University Teachers of English and was a passionate promoter of literature throughout his life. Bedford died in Winnipeg in December 2008.